Synopsis: We begin with Hayate asking for some advice from the love master, Aika. She doesn't believe Hayate would make such a straightforward declaration that he was becoming too popular at first, but he reveals that he had inadvertently made a girl fall in love with him. For some reason, Aika shows him a picture of her boyfriend and Hayate agrees that he is quite handsome. She continues her story and tells him about her trip to Tahiti with him wherein he never even once approached her -- in short, nothing happened on the trip except for him calling her "milady" for the entire trip. She also saw him happily speaking with a local girl. And you'd better not forget that, son! Done with her story, Aika tells Hayate that half-hearted kindness can earn great anger. We cut to a flashback with Hayate and Konoha together looking for a part-time job. She asks him if he is dating Ayumu and he responds the same way he always has that he's Nagi's butler and that he can't have a romantic relationship. Lol that "tugging on your sleeve attack" gets em everytime! 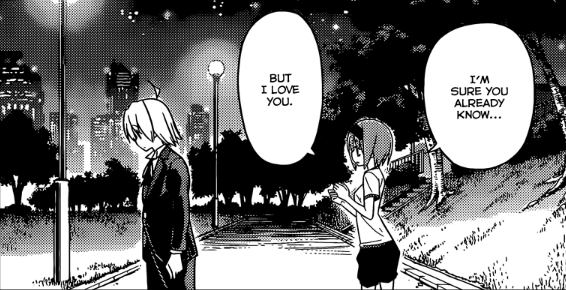 However, Konoha proposes that it doesn't have to be romantic between them and that it would be enough for her if they could just keep getting along. We return to Hayate and Aika and he's totally perplexed by what Konoha meant. 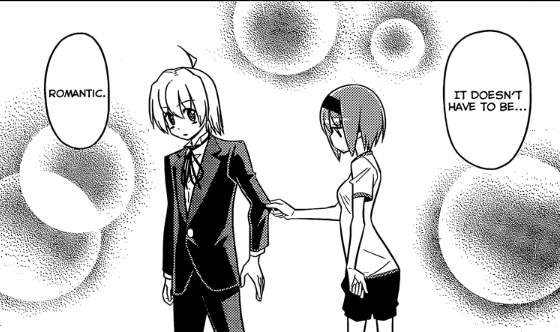 Aika concludes that Hayate is popular and that the girl is in love with him... obviously. She also adds by saying that she thought that he was only popular with flat-chested girls and assumes that Konoha is a large-breasted girl by what she said. 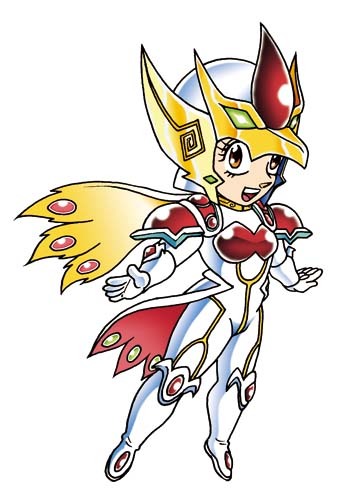 Shut up, Aika! Flat chest is a status! She warns him that girls in love are especially cute and will often talk in a sweet voice that you never hear anywhere else when they are speaking with the one they love... just moments before her boyfriend calls her and she starts speaking in said cute voice. Of course, Hayate wasn't supposed to hear that and she slaps him one after the conversation with her BF. After that, she gives him some advice for dealing with Konoha by basically luring her into the dark and seducing her into kissing him. Hayate follows her advice for some reason and it actually works and she ends up confessing to him and then kissing him -- which is what Ayumu saw in the previous chapter. Hayate rushes back to Aika to complain, but she is surprised to hear that he didn't want to date Konoha after all. Review: Okay, so it really was a misunderstanding between Konoha and Hayate, but the kiss was certainly real. 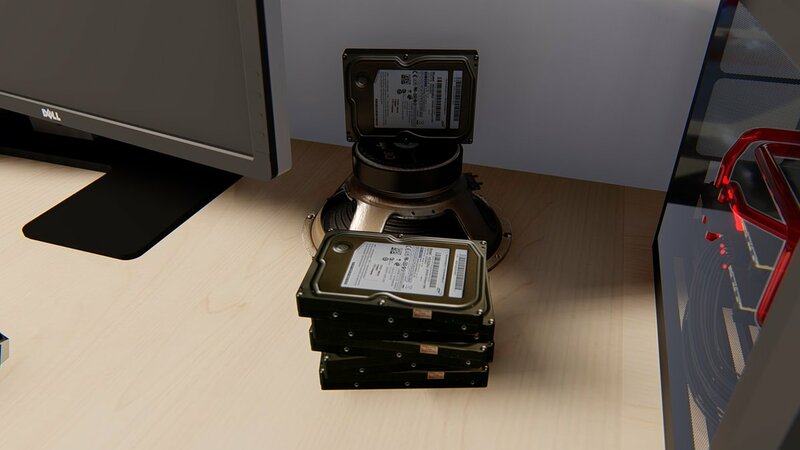 Anyway, It's going to be interesting how this turns out. On the other hand, it doesn't have to lead to anywhere because Hayate has already found a job for Konoha and doesn't really have to do anything with her now... except that he's somehow suckered himself into a pseudo-dating relationship with her. 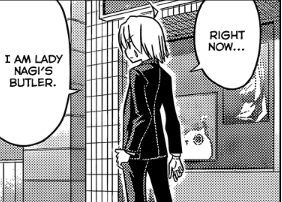 It's going to be interesting to see how the other girls react once they hear of this from the hamster -- assuming that Hayate doesn't sort out this misunderstanding first. Still, this new girl is certainly super-aggressive, but she doesn't have Ruka's charm for me. She just seems to be a rather plain, poor girl with a nice body and a cute face -- that's all. 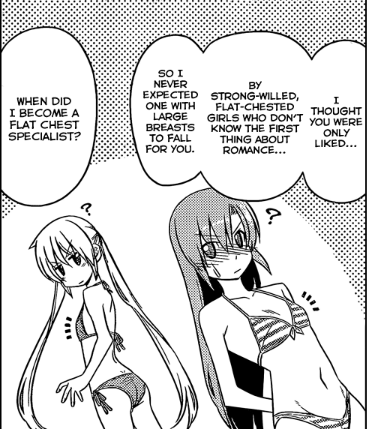 In any case, Hayate hasn't been shown to have any real feelings for her the way he did for Ruka, so I can't really see this ship taking off any more than it already has -- but, you never know with Hata-sensei. One thing that I found interesting aside from seeing Aika flustered once again is her perception of Hayate as being a flat-chested tsundere magnet only. It's interesting to see how the characters view one another within the Hayate-verse since it's very different from what you would see as the manga reader. The case of Aika and her view of Hayate is one example, but another example would be Wataru and Saki only finding out just recently that Ayumu was in love with Hayate all along. The fact that the different characters all have incomplete information regarding one another really serves to make their interactions that much more realistic for me. Anyway, no speculations for now, but I liked this chapter. Oh, and I liked that one panel with Hina and Nagi in a rather fanservicey pose as well... I'm a lolicon, that's why. Anyway, it seems the next chapter will be released on Nagi's birthday, so that's going to be something special, I hope. Well, Konoha did end up turning down that job, so technically hayate might still feel obligated to help her anyway, he is that kind of guy. And this is basically turning into Ruka all over again, just replace Nagi with Ayumu. Actually, he found another job for her, it seems? Check the first panel of page 15 when Hayate tries to say his goodbyes to her.